Integrated with a speaker unit and panel, the PC-1869 Ceiling Mount Speaker is of all metallic construction and ideal for use in a voice alarm system. It feature spring clamp mechanism for easy speaker mounting to the ceiling. The input impedance can be easily changed by changing the tap position of the transformer. The push-in type input terminal block makes cable connections easy and allows bridge wiring. 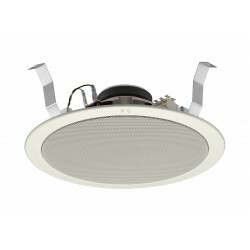 ZS-645R Ceiling Mount SpeakerTypeFlush Ceiling MountRated Output6WRated Input Selection/Impedan..
ZS-646R TOA Ceiling Mount SpeakerTypeFlush Ceiling MountRated Output6WRated Input Selection/Imp..
TOA ZS-2852Integrated with a speaker unit and panel, the PC-2852 Ceiling Mount Speaker is of all met..
TOA Z-122C The Z-122C ceiling and wall-mounted speaker covers an extremely wide area and can be..
TOA Z-2852CThe Z-2852C ceiling and wall-mounted speaker covers a wide area and can be used for 25, 7..
TOA Z-2322CThe Z-2322C ceiling and wall-mounted speaker covers an extremely wide area and can be use..
TOA Z-2352CThe Z-2352C ceiling and wall-mounted speaker covers an extremely wide area and can be use..
TOA Z-2352SCThe Z-2352SC ceiling and wall-mounted speaker covers an extremely wide area and can be u..
TOA Z-1522SCThe Z-1522SC ceiling and wall-mounted speaker covers an extremely wide area and can be u..
TOA ZV-064Input capacity : 6WLevel Control : 4 step; 0(OFF), 1,2 ,3Material : ABS Res..
TOA ZV-303Input capacity : 30WLevel Control : 4 step; 0(OFF), 1,2 ,3Material : ABS Re..